We have lived in this house for 10 years. I know this, because the lowest marks are the growth chart wall are from February, 2003. Grace was 2. Andra was 4. After several years of focusing our energies on other things, I realized that we needed to pretend this was a new house and start in one corner, and clean and paint it. This week, we committed our time to this project. Day 1: We cleaned. I vacuumed and dusted just about anything I could. Like lampshades and blinds. 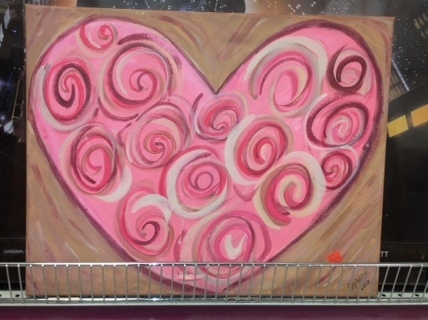 Day 2: Bought paint. Lots of paint. Transferred heights from the growth chart to a cleaned up version of the growth chart. Day 3: Vacuumed and dusted the taxidermy. For real. Found a love note from one of the girls (I supsect Grace) in an air duct that I was vacuuming several cat’s worth of fur from. Got Grace’s room painted (by Isaac ). Went to the bank / tire place / post office / car wash / doctor. Played Chutes and Ladders and finished a puzzle of baby animals. Took pictures and switchplates off the walls. Took Grace to the allergist. Day 4: (STILL ONLY TUESDAY) Painted the master bath walls and ceiling. Went to a meeting. Day 5: Baby gets oral surgery. Ouch. And painted the laundry room walls and ceilings white. Day 6: Isaac painted the hall and ceilings. I painted the laundry room cubbies green. Day 7: Went to work. Ran errands. Got my flat tire fixed. Put all the laundry room crap back. Hug up some artwork. Realized Easter was in a day. Bought eggs. Day 8: Prepped for Easter. Put things away. Day 9: Easter. So. Done. I have come across a couple situations recently where I have been asked to write. Poetry slam at the junior high, where the two super cool, gritty poetry slam chicks (they were definitely not girls, they were chicks) encouraged everyone to do a sixty second free write. 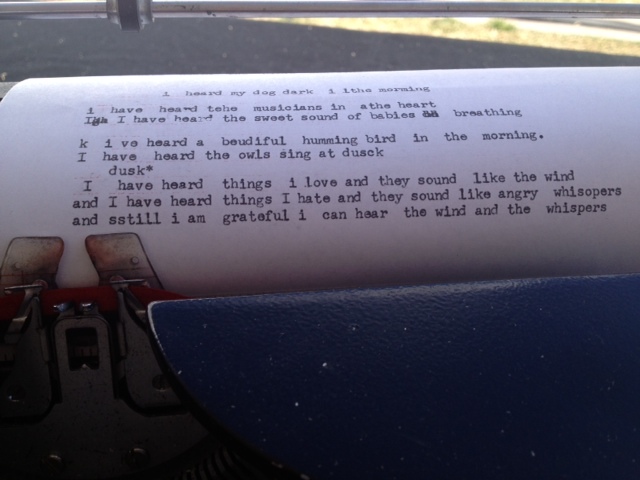 Poetry booth at the Tucson Literary Festival with typewriters. TYPEWRITERS. Really, you can’t resist a good typewriter and a chance to pound out some wonderful words on a vintage typewriter. Both times it was like slipping into an old cashmere sweater – soft, washed too many times and with four dog claw marks in the back so it looks like I was attacked by a hungry bear (ok, sidetrack. That’s a story for another day). The words just slipping out, and hitting the page with too much force for regular words. For me, right now, the words all come back to Andra. I read early on that I should write. I should write everything, and all the time, and it would help me. But after about two minutes of that I realized that writing it down was pretty pointless. Because I didn’t want to remember how I felt. Because I was trying everything I could not to feel it. I couldn’t think of ANY reason anyone else was going to want to know how I felt either. I used to write for the girls. I was down one. I didn’t want Grace to know how awful I felt about that. That was why I wasn’t writing. I even believed it. But when I was pounding on the typewriter and the words were just there, as they are, I realized why I really couldn’t write. When I write, the words don’t lie. Stephen King says that writers have a secret – that their words come through them, not from them. Maybe the universe doesn’t have a good poker face. I don’t either, but in spite of it, I love to play poker. I suppose, perhaps and maybe, that playing something you love, even if you are a bad liar, is the honest thing to do. Even if it makes you have feelings. Banner stolen from Younghouselove.com – because they said I could. We have been doing our versions of challenges for years – we copied my cousins the Mitchells, and then we tried a version with Andra’s friends, after which Grace crafted an endless set of fun challenges at most of the stores we go to. There are cash limits, and challenges – for example, the first one we did was $8, at Walmart with Andra’s friends, and you had to get something to eat, something on sale, something for your hair and then you could spend the rest on yourself. It was amazing how creative they were – buying a single lime ($.10!) as their food, or buying a hair tie ON SALE to maximize the left over cash. In spite of its wildly inappropriate content, I can’t help but like the song Thrift Shop, by Macklemore and Ryan Lewis. So I sent it to Jennie, who sent me this. 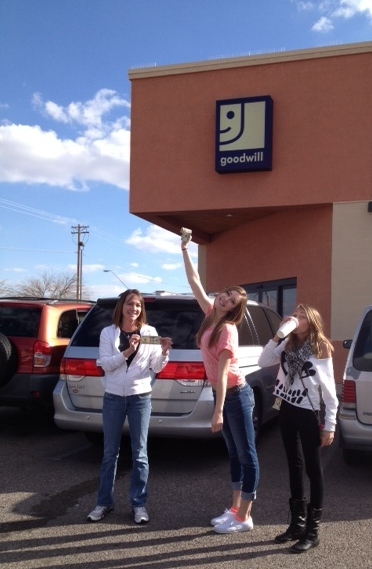 We cruised in with our $20. At first, I wasn’t sure we could do it. But while we officially name Kara the winner, we all ended up with some good loot. $20, $20, $20, $20 (not shown) and some Starbucks. 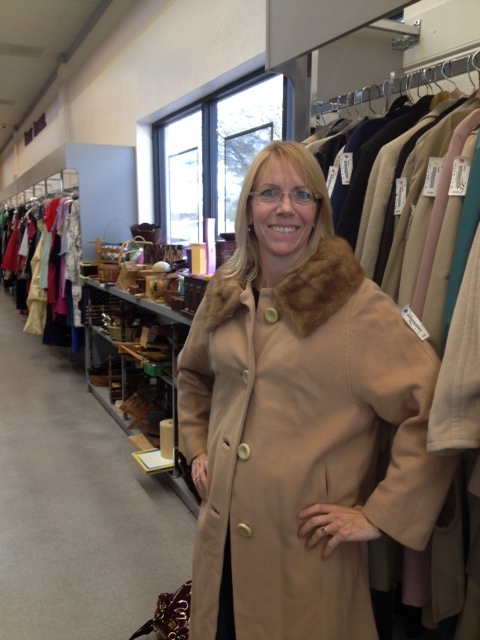 I found me a Big A$$ Coat with a real fur collar! And yes, that is my patent coach bag thrown on the floor behind me. 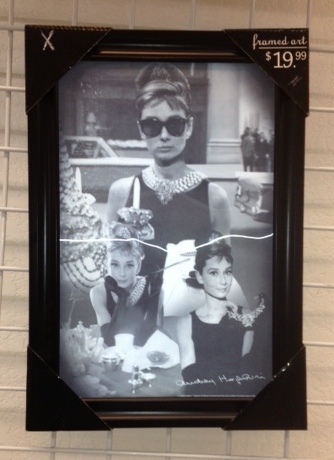 Andra was lurking around every corner at the Goodwill. Which makes sense – helping others hunting for a comeup is just her kind of thing. 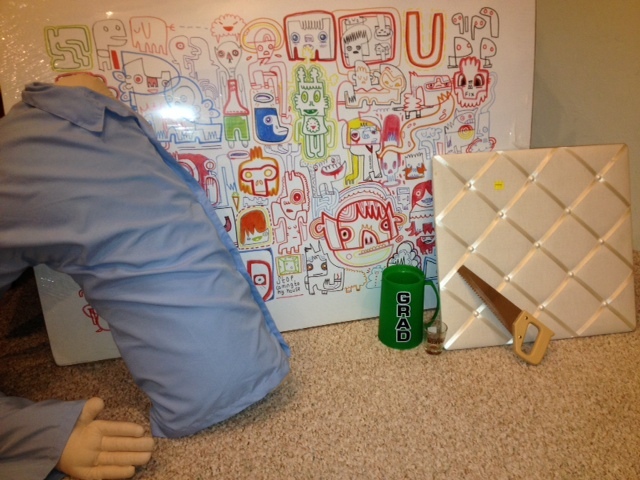 A pillow man, a poster, a pin board, a Grad mug in her school colors, a shot glass, and hello! A tiny saw! 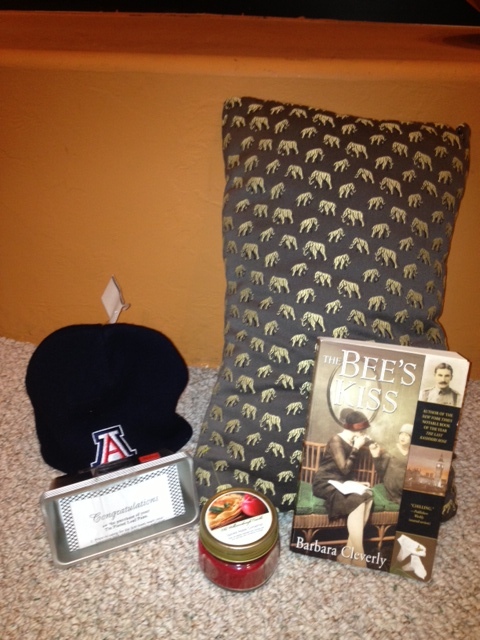 An elephant pillow, a book, a candle, mini loaf pans, and a U of A beanie! I got MOMA note cards, a snack maker (yum! 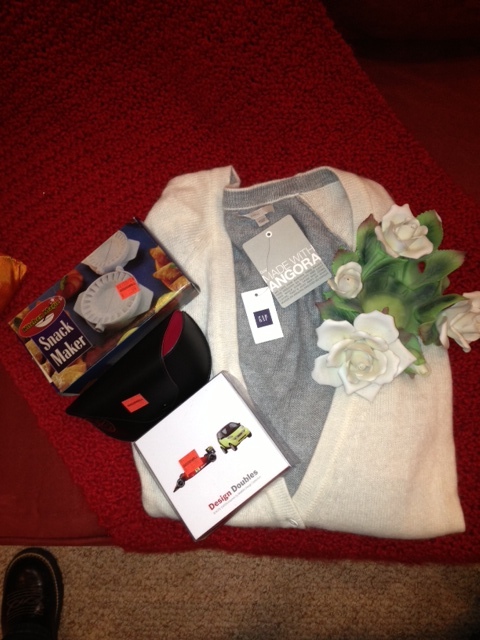 ), a tags on Gap angora sweater, a ray ban glasses case, and ceramic flowers for the imperial throne (code word for the cemetery). 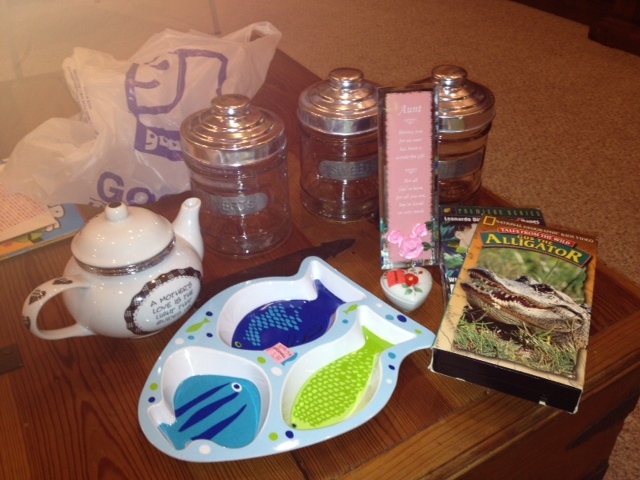 And Grace pulled us up by buying some fantastic glass jars for her room to store makeup, Romeo and Juliet and Alligator VCR tapes, plus a present for each of us and for one of her friends. Always thinking of others, that girl. I am grateful to Young House Love, a new favorite blog – in the words of Jennie, its writers are bright, upbeat, but not so perfect we can’t still like them. I have to agree with her, because I pretty much always do. All in all, I think the trip was a win. I didn’t rebuy anything I had donated to Goodwill myself (although there was something I was looking for), we had a good time, and I was reminded that when I donate our stuff, I always say “I just want someone to use it” – and here? People do. Aside: There are so many great lines in this inappropriate song, one of my favorites is this: Referring to paying $50 for T shirt – “I call this getting tricked by Business.” Indeed! This January I am feeling like cleaning house. Getting a new start with the new year. So much of the past two years has been so foggy and muddled and lost, and while I can’t get the years back, I look around and see places I can simplify. Streamline. Start something. The challenge with this, that has dogged me for years but is more pronounced now than ever, is that to clean house (literally) I am grieving not only the loss of Andra, but the loss of little kids. Its twice as sad. I have mentioned before that it is hard to connect the first 12 years of parenting with today. But as Grace is growing up, it is more poignant. When Andra was 12, she cleaned her room. Out with the stuffed animals. The dolls. Little kid toys. Then, we just moved them all across the hall to Grace’s room. Now, Grace is 12. All that stuff is moving right back across the hall. We can’t keep everything. We have to let someone else love some of our stuff. But going through all the stuff reminds me of such happy times, such wonderful adventures and such hopeful times. It reminds me of little kids. We just got back from the beach. No one asked for an inflatable whale. Instead, we got henna tatoos. This Christmas there weren’t games or toys under the tree – there was makeup, and perfume and clothes. This growing up is normal. This change is normal. This should be happening. If Andra were here, it would still be happening. But having the loss of Andra over it all, makes mourning the loss of little kids larger. Cleaning out the linen closet comes with the pom poms and pipecleaners and random craft stuff no one will use again. It comes with crayons, little girl hair pretties, secret notebooks filled with bad spelling – all remnants of a great childhood. The problem, is that now that I know that is all it was destined to be, it makes the new start that much harder. Start I must. Let go a little, I will. I resolve to double down my efforts to invest the emotion I felt in the past, back into our future. I will secret away some of the little kid stuff, because I can. Some of it, however, I need to release to the past and accept as part of growing. In November, Grace and I went to visit Jacki and her family. The first day we were there, we raked leaves. It had to be done, and Jacki thought it would be fun for our desert girl Gracie to experience the leaf piling and jumping. For the first hour I provided unskilled labor, I really enjoyed the raking, and the clearing out of something old to make room for something new. I didn’t think about it too much, I just raked. For the next hour my hip started to hurt and I thought mostly about what kind of people plant so damned many trees in their yard, if they know that they have to rake them all up every year. Third hour, reinforcements arrived, and I helped clear out a couple flower beds. That was when I realized us desert dwellers are missing out. In places like Arizona, while there is some winterizing we do in our yards and gardens, it is nothing like what you do in places that grow things. And it seemed like to me, the process of clearing dried stalks, and pulling up roots in a garden you planned and planted requires a great deal of faith. You have to believe that clearing out things makes room for new things. You have to hope that seeds that have dropped have fallen on fertile soil, and that after some time, some weather, and some water they will grow. It takes a leap of faith to lose something without really knowing what you will get the next year when the sun comes out again. You will have flowers again. I don’t mean for everything to be so clearly metaphorical, really. I thought all this just really thinking of gardening. But now that I read what I have written, I have to come back and close with a little Voltaire. Metaphorically speaking, it was good for me to work in the dirt to remember that we need to cultivate our garden. And if we do, we will have flowers. Next post assignment: frivolity. I’m on it. Tomorrow, the sun will rise. And tomorrow, by my count, Grace will be 12 years and 115 days old. It will be the first day she will be an age Andra never was. It is both extremely sad, and divinely hopeful for me. It is new territory, where I have no expectations, and nothing to compare it to but old memories from the edge of the 80s when I was a girl. I had fabulous perspective, and joy, and rationalization for a few months after we lost Andra, but then I got lost for a while. I didn’t take notes, I didn’t write, and I didn’t blog. I didn’t want to hurt, or to hurt other people. I have shared with many people, been supported by many people and given many people shards of my pain in ways that may or may not have been particularly kind, but nonetheless was what I had to do. For that, I am truly sorry. I haven’t been myself. The reality, however, is that I will never be myself again. I have done a lot of good things. I have done some bad things. I have dragged my feet, and then gotten way ahead of myself. I have had a bigger picture focus, while seeing alot of little, tiny things, right in front of my face that I didn’t notice before. I don’t want to do anything, somedays, but then I want to do great things – HUGE THINGS – for Andra, in spite of Andra, and because of Andra – but also for Grace. And for me. And for Phil and for you. And I will. This new version of me will do great things. Starting tomorrow, I will breathe a sigh of relief for 12 years and 115 days. I will be thankful for that day. I will be thankful, every day, for Andra. I will love Grace anew each and every new day. I will try, as hard as I can, I swear it, to embrace this broken, wonderful me and what she has to give the world. At that moment, the chorus kicked up on the radio, and Grace and I sang along. I am changed. And while it causes a violent and visceral reaction to say it, I WILL be changed for good. Both meanings intended. Whether I like it, or not.